For the year to June 2017, the Sunshine Coast recorded its highest ever domestic visitor numbers, attracting 3.4 million arrivals and 12.4 million visitor nights (up 4.4%), on the back of strong increases in the interstate market (up 13.9%) and the Brisbane drive market (up 16%). The record visitor numbers contributed $2.06 billion to the Sunshine Coast economy. A feature of the results for the 2016-17 financial year was an 8.3% increase in business travel, reflecting a strong year in business events, combined with business travel associated with the opening of new infrastructure projects such as the state-of-the-art Sunshine Coast University Hospital. Visit Sunshine Coast CEO Simon Latchford said that the Sunshine Coast tourism sector couldn't have received a better birthday present. “It was 50 years ago last month that the Sunshine Coast name was officially proclaimed, and it is fair to say that never before in the history of the region's tourism sector can we look forward with so much confidence,” said Mr Latchford. 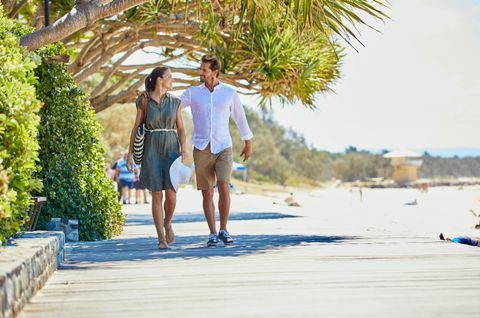 “Sunshine Coast Airport has been Australia's fastest growing airport for quite some time, and with Qantas, Virgin and Jetstar announcing increased direct flights into the Sunshine Coast, we are confident of continuing the growth in domestic visitor numbers. “It is particularly pleasing to see the new Jetstar Adelaide to Sunshine Coast route that commenced last year starting to pay dividends as the region attracted 50,000 South Australians to the year ending June 2017. “The winter season has been the strongest ever for most of our operators. Thanks to the support and working closely with Sunshine Coast Council, the region has attracted some key national conferences and events over the past quarter, including the high-profile Australian Cruise Conference, Australian Society of Travel Writers Convention and the Australian Event Awards, and next year's events calendar looks equally strong. “This year, team Sunshine Coast not only attracted major sporting events such as the Ironman and Velothon, but our Sunshine Coast Lightning netball team won the Australian championship in their very first year. In 2018, visitor numbers from sport will continue to grow as a number of international teams will prepare for the Commonwealth Games on the Sunshine Coast. “Our major priority now is to see more sustainable, high-quality accommodation and attractions developed to maintain the tourism momentum as we are constrained at times by not having enough suitable offerings.